But when Zeus was full-grown, he took Metis, daughter of Ocean, to help him, and she gave Cronus a drug to swallow, which forced him to disgorge first the stone and then the children whom he had swallowed, and with their aid Zeus waged the war against Cronus and the Titans. They fought for ten years, and Earth prophesied victory to Zeus if he should have as allies those who had been hurled down to Tartarus. So he slew their jailoress Campe, and loosed their bonds. And the Cyclopes then gave Zeus thunder and lightning and a thunderbolt, and on Pluto they bestowed a helmet and on Poseidon a trident. Armed with these weapons the gods overcame the Titans, shut them up in Tartarus, and appointed the Hundred-handers their guards; but they themselves cast lots for the sovereignty, and to Zeus was allotted the dominion of the sky, to Poseidon the dominion of the sea, and to Pluto the dominion in Hades. Cecrops, a son of the soil, with a body compounded of man and serpent, was the first king of Attica, and the country which was formerly called Acte he named Cecropia after himself. In his time, they say, the gods resolved to take possession of cities in which each of them should receive his own peculiar worship. So Poseidon was the first that came to Attica, and with a blow of his trident on the middle of the acropolis, he produced a sea which they now call Erechtheis. After him came Athena, and, having called on Cecrops to witness her act of taking possession, she planted an olive tree, which is still shown in the Pandrosium. But when the two strove for possession of the country, Zeus parted them and appointed arbiters, not, as some have affirmed, Cecrops and Cranaus, nor yet Erysichthon, but the twelve gods. And in accordance with their verdict the country was adjudged to Athena, because Cecrops bore witness that she had been the first to plant the olive. Athena, therefore, called the city Athens after herself, and Poseidon in hot anger flooded the Thriasian plain and laid Attica under the sea. Here is a sanctuary of Poseidon, surnamed Prosclystius (Flooder), for they say that Poseidon inundated the greater part of the country because Inachus and his assessors decided that the land belonged to Hera and not to him. Now it was Hera who induced Poseidon to send the sea back, but the Argives made a sanctuary to Poseidon Prosclystius at the spot where the tide ebbed. Cecrops married Agraulus, daughter of Actaeus, and had a son Erysichthon, who departed this life childless; and Cecrops had daughters, Agraulus, Herse, and Pandrosus. Agraulus had a daughter Alcippe by Ares. In attempting to violate Alcippe, Halirrhothius, son of Poseidon and a nymph Euryte, was detected and killed by Ares. Impeached by Poseidon, Ares was tried in the Areopagus before the twelve gods, and was acquitted. It seems like the poor chap was unable to catch a break. Is this really the case? Has Poseidon ever won a dispute with another Olympian? In the scramble for patronage over city territories, there's an occasion on which Zeus declared a draw between Poseidon and Athena when these two competed for Troizenos [Troezen]. According to Pausanias' Description of Greece, by Leïs, the first princess of the city, Poseidon became the father of Althepos [Althepus], who became king when he grew up, naming the land Althepia. During Althepos' reign, his father Poseidon and his cousin Athena came to lay claims to the city and Zeus declared it theirs in common so that Poseidon was honoured as Basileus, "King," and Athena under the names Polias, "Urban," and Sthenias, "Mighty." It was a few generations later that the city's name was changed to Troizenos. "Moreover," says Pausanias, "their old coins depict a trident and a face of Athena." 2 chapters later in the same travelogue, however, Pausanias mentions the origin of another of Poseidon's local cult titles. "Being wroth with them [the citizens], Poseidon smote the land with barrenness, halmē [brine] reaching the seeds and the roots of the phyta [plants], until, appeased by sacrifices and prayers, he ceased to send up the halmē upon the earth." And hence he was called Phytalmios, "Nurturer." The reason for the god's anger is not mentioned but it's not impossible that he received poorly the requirement to share honour with his niece in yet another polis. At any rate Poseidon did in fact become a much more important deity at Troizenos than Athena. I take the term Olympian to denote any of the major gods of the mainstream Hellenic religion, which includes Helios, the Sun, and the wine-god Dionysos [Dionysus]. The latter in particular eventually came to actually live on Mt Olympos [Olympus] and, according to Diodorus Siculus' Bibliotheka Historika 4.15.1, officially bore the title Olympios, "Olympian." If, on the other hand, you are restricting the term to only the original list of the Twelve Great Gods, then what follows might not be much help. In the same genre and story series of Major City Scramble Among the Gods, Poseidon contested with his cousin Helios for possession of Korinthos [Corinth]. Pausanias relates this event at the beginning of the same book of the travelogue in which he later narrates the Poseidon-vs-Athena disputes over Kekropia-Athens and Althepia-Troizenos. 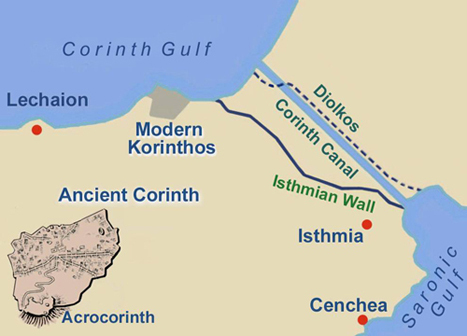 According to what the Korinthoi [Corinthians] told Pausanias, the Hundred-Handed Giant Briareus (perhaps having been delegated the assignment by Zeus) adjudicated between the Sea-King and the Sun, giving the Isthmos [Isthmus] to the former and the Akrokorinthos (the height above the city) to the latter. That account makes it sound like an amiable resolution to a mild tiff about office stationery, but in Nonnus' Dionysiaka, an extremely dramatic rendition of the story is narrated by Poseidon himself at the beginning of a tumultuously epic battle between him and his nephew Dionysos. In a bid to discourage the new wine-god before the fighting begins, Poseidon's allusion to his contest with Helios fails to mention any third-party arbitration. Perhaps, however, we are to understand that the quarrel regarding which Briareus issued judgement was a bodily ἀγών [agon], i.e. hand-to-hand combat as opposed to a test of rhetoric, so that he is more of a ringside referee than a courtroom magistrate. And, if we are to believe the Sea-King, going by the amount of violence that ensues in his narration, they may well have needed such a gigantic referee. "Heaven," Poseidon says to Dionysos, "still trembles at my spear of the deep, Heaven knows what a battle with the Sea is like." He goes on to claim that the Sun felt the point of the sea-god's Trident, and that the Sea rose so high it even went into Αἰθέρος (Aether, the clear, bright air above the clouds), bathing the flaming sun-chariot in its waters even as the Titan charioteer was going about his daily journey across the sky. Canis, the Dog-constellation associated with an especially hot season, "found salt water close by to bathe in and cooled its hot chin. The deep bottom of the waters was uplifted in towering waves, and the dolphin of the Sea met the Dolphin of the Sky [the constellation Delphinos, "Dolphin"] amid the lashing surges!" Perhaps at this point Briareus perceived that things had gotten way out of hand and decided to call it a draw between the two opponents. A very similar turn of events occurs in the dispute between Poseidon and Dionysos but the effect is unique in Poseidon's experience and is rather curious for the piece of literature in which it is found. The battle which ensues between their two armies is by far the most violent action sequence between two groups of deities in this mythology since the Titans' War. Over the course of three episodes (Books 41-43 of the epic), Nonnus is essentially allegorising the story of how Berytos [Berytus], now Lebanon's capital city Beirut, became the principal polis of Roman Phoenicia. In like manner to Poseidon's popularity contests with Hera, Athena and Helios, the King of the Sea clashes with his nephew over ownership of this Near Eastern centre of imperial influence. In this instance, though, the city has been personified as Beroe, a daughter of Okeanos who occurs as a minor character in Virgil's Georgics. In the first story, which is cosmic in scale, Beroe is an Oceanid and her uncle the Titan-King Kronos is the first person to ever build a city, which happens to be none other than the magnificent Berytos. It is implied that Zeus was born here, or at least that the stone which Kronos swallowed instead of his son was served to the Titan while Kronos was enthroned here. 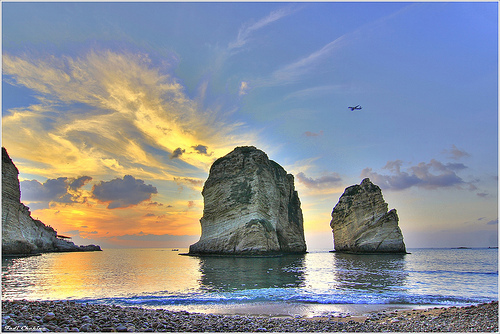 In this context Nonnus reports that the famous tradition about Aphrodite having first made landfall on Cyprus Island is really a lie, because she actually first touched terra firma at this most ancient Lebanese port, a few days east of Cyprus (41.66-118). The Dionysiaka's interest, however, eventually shifts and settles upon the second story, which makes Beroe (and thus Berytos) much younger, as the alluring mortal daughter of Aphrodite by the Assyrian prince Adonis. The story is thus framed, rather than a fight for territorial acreage, as a romantic fantasy action drama featuring a contest about who will become Beroe's bridegroom. Nonnus does, however, completely spoil the ending by starting off with a declaration of who gets the girl, which information is supplied to the audience even before the rival suitors seem to be aware that the young woman exists. When Beroe grows up in Book 41, Zeus sees her and is charmed with reminiscences of another beautiful Asian princess, namely Europa, whom he long before then abducted after assuming the form of a bull which was eventually placed in the sky as the constellation Tauros [Taurus]. The king of the gods fantasises about reenacting the abduction the same way, in bull form, but Tauros senses this and bellows aloud his displeasure at the potential of eventually being rivalled by a second bull-constellation in the sky. So Zeus "left Beroe, who was destined for a watery bridal, as his brother's bedfellow, for he wished not to quarrel with Ennosigaios ['Earth-Shaker'] about an earthbound wife." At the end of Book 41, Aphrodite charges her son Eros to inflame both Poseidon and Dionysos with passion for Beroe, which command Eros obeys at the beginning of the next book. The two impassioned gods each then attempt to woo Eros's young half-sister and they present their cases in terms of what magnificent dowry they have at their disposal. Aphrodite claims that she wishes she could grant both gods the honour of being Beroe's husband but since this would be unlawful, her solution is that they must duke it out in combat against each other, winner take all. She, however, causes them to swear "by Kronides [Zeus] and Gaia, by Aither [Aether] and the floods of Styx" that the loser will not lay waste to Berytos, whether by earthquake in Poseidon's case or by destruction of vineyards on the part of Dionysos. The three Fates themselves witness this most solemn oath, upon which each god promises not only to be at peace with the city but also to directly participate in its beautification and to grant it prosperity. With that admin out of the way, Zeus himself descends from Mt Olympos together with all its divine inhabitants in order to watch the agon between the older god and the younger one. Book 42 then concludes with a second spoiler about who's going to win, when there "appeared a great omen for love-stricken Dionysos." A falcon was pursuing a pigeon when suddenly a haliaïetos, "sea eagle" (called an osprey or fish-hawk in English), snapped the pigeon up off the ground and flew, with it in its talons' grasp, towards the depths of the sea. When Dionysos beheld this, he cast away hope of victory. Nevertheless he entered the fray. Kronion the Father [i.e. Zeus] was pleased with the contest of these two, as he watched from on high the match between his brother and his son with smiling eye. Now in spite of the discouraging omen, and the narrator's remark about Dionysos practically throwing in the towel before the action begins, the two relatives start out Book 43 with a spirited rap battle, complete with pre-rugby-match-style psych-out war-dancing, before their armies descend upon each other with no holds barred. All the sea deities, and most freshwater ones, side with Poseidon. Dionysos, who has just conquered the Indians, together with them among his forces, also has elephants from their country, as well as bears, panthers and other wild beasts, and also Panēs [Pans], Seilenoi [Sileni] (some of whom are riding horned bulls) and Satyrs. Troops of women augment the wine-god's regiments too: the Mainades, Bakkhantes, Mimallones and Bassaridai, together with a number of nymphs. The opposing forces rip up the countryside and hurl huge rocks and even entire cliff-sides at each other. In 43.337-340 one of Poseidon's sea-lions is attacked by a strange phenomenon: an elephant which is described as hypsinephēs, "as high as a cloud." I can think of only two ways of interpreting this: either the elephant can fly or it is so big it is quite literally a skyscraper (which would be gigantic even in comparison to J.R.R. 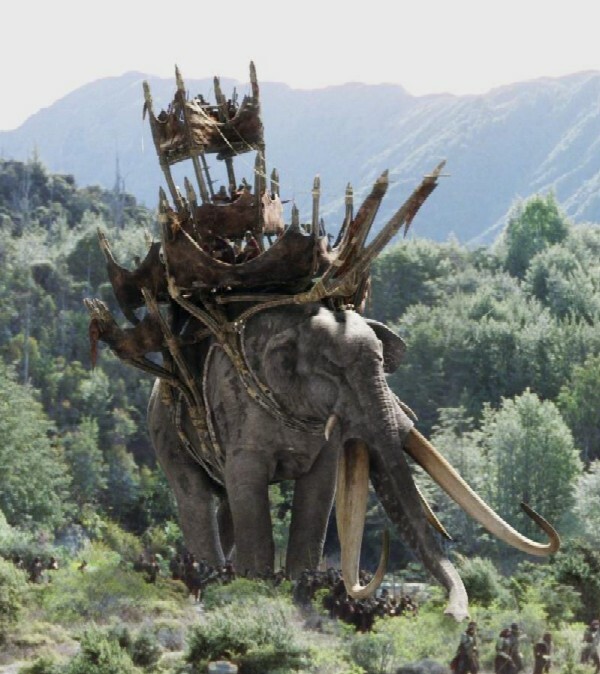 Tolkien's Oliphaunts)! Either way, with that sort of clout, the battle should be over, but as though that's not enough, one thing happens to turn the tide to its tipping point. One of the Bassaridai, in a Dionysian frenzy, charges onto the sea and begins to dance, stamping her feet against the water's surface, and not sinking while she does so. Fire then blazes forth from her hair, directed at the sea and its inhabitants. Horrified and bewildered at this, the Nereid Psamathe launches into a lamentation prayer to Zeus, detailing her fear that Dionysos will kill the sea-god Glaukos and enslave her father Nereus, her sister Thetis, and even Dionysos' own aunt Leukothea. Psamathe begs Zeus to spare the sea-deities the madness of Dionysos. Surprisingly, and very anticlimactically, Zeus immediately complies, hurling thunderbolts all around Dionysos to indicate to him that it's Game Over...| just when it seems like the younger god is going to win! Immediately following this is the wedding of Beroe to Poseidon, celebrated in the sea, with the river-gods bringing many gifts. Dejectedly, Dionysos sulks his way through the nuptials until Eros comes to persuade him that other prospects await him on dry land. Taking heart, the young wine-god leaves, heading for his mother's home city. In the battle for Beroe, Dionysos seems to have the upper hand against Poseidon when Zeus pulls rank on his son, rendering the Sea-King's victory a T.K.O. Nonetheless, unlike Briareus' ruling regarding Korinthos, or the decision about Troizenos, this one is not a draw at all. Poseidon has unequivocally won the day. It is a double victory: Poseidon acquires not only exclusive rights to a coastal city (finally) but also a well-desired bride. A technical one; when he teams up with Hera and Athena and traps Zeus and refuses to let him free. "from Kronos’ son [Zeus] the dark-misted, that time when all the other Olympian gods sought to bind him, Hera and Poseidon and Pallas Athene. But that is three gods, not just Poseidon. So if you don't count that, I would tend to say no. Not the answer you're looking for? Browse other questions tagged greek olympians poseidon or ask your own question. How did Poseidon became lord of Helicon? Why wasn't Poseidon turned into stone? Why is Plato singling out Hestia, Zeus and Athena in Laws? Is there a story that places the Amazons against Ares? Why would Athena fear Poseidon?